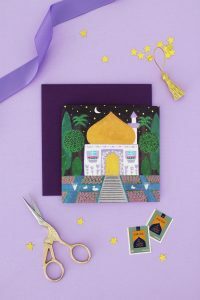 DIY Eid al Adha Jewelry – Hello Holy Days! Do you have a child that loves to make jewelry? They are going to love this DIY Eid al Adha jewelry! I have a 10 year old niece, Ayesha, who loves to make jewelry. When she comes over, particularly when she comes over for sleepovers, one of the things she frequently wants to do is make jewelry. She loves to wear jewelry but she only likes to wear jewelry that is handmade – she has a firm policy against wearing any store bought jewelry (lol). Inspired by my niece’s love for kid made jewelry, I’ve come up with crafts for some DIY Eid al Adha jewelry in spirit of the holiday! Cocktail rings shaped like sheep, bracelets featuring the Kaaba and necklaces with pilgrim pendants. Kids will love wearing these as much as they will love making them! This craft is also great for big groups of kids and is adaptable to different ages. Have a DIY jewelry station at your next Eid party by laying out the supplies for kids and letting them make their own jewelry favors to take home! Who doesn’t love a cocktail ring? The best part is that this one is fuzzy too! 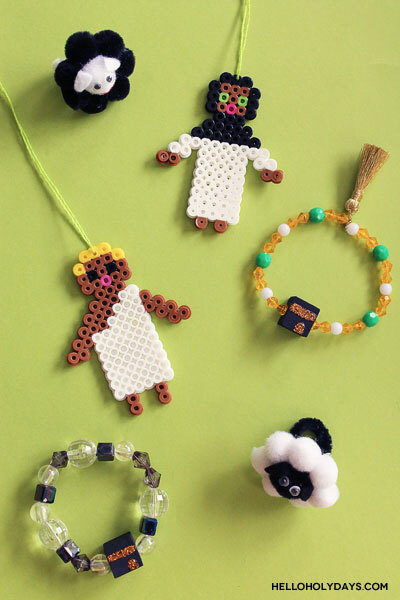 Plus, you don’t have to limit these adorable pompom sheep to just rings – make them into a bracelet too! Glue the small sized pompoms all around the medium sized pompom so it resembles a flower. 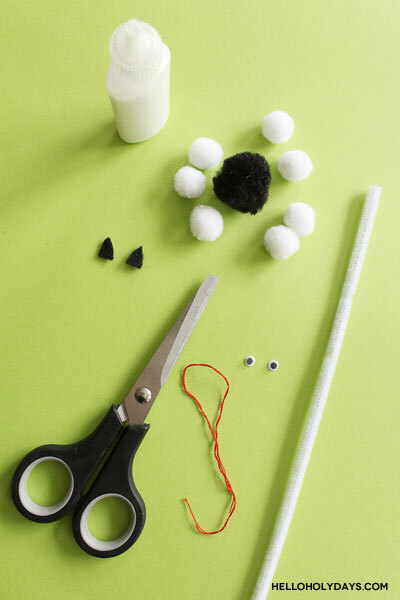 Make it look like a sheep by cutting small ears from felt and glueing to the centre pompom. Next add googly eyes and a smile by cutting a small piece of red thread and glueing it onto the sheep. Complete the ring by cutting a piece of pipe cleaner and glueing it to the back of the sheep. Shape the pipe cleaner into a circular shape that fits around finger. 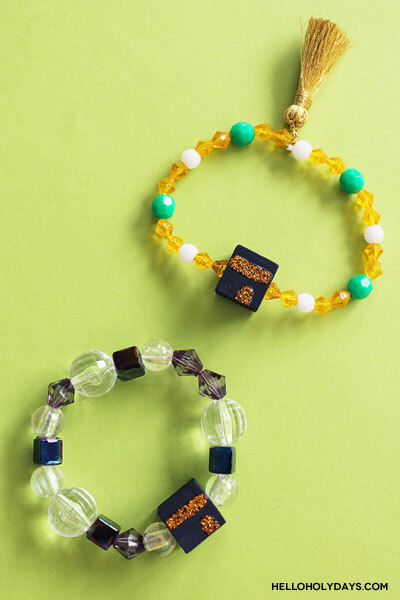 These beaded Kaaba bracelets are made by hand painting your own Kaaba shaped bead first. Then, pair with whatever kind of store bought beads you like! Here, I stuck to holiday colors with a color palette of white, black, gold and touch of green. 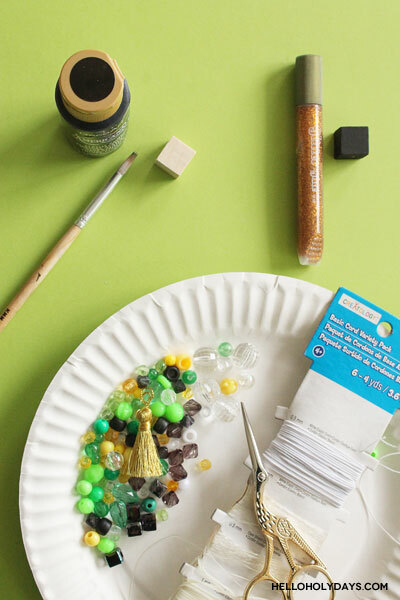 If making with small kids, it’s a good idea to make the Kaaba shaped beads in advance and swap out small beads for larger beads appropriate for your child’s age. Paint the 1″ cube beads in black acrylic paint using a paintbrush. When the paint has dried, use the gold glitter pen to make the black bead look like the Kaaba. With a steady hand, paint a stripe and door with the gel pen. Once the glitter pen has dried, you’re ready to start beading! Use beading cord and beads of your choice to make whatever patterns you like. If desired, you can even add on mini tassels to your bracelets. To finish, tie off your bracelet and cut off excess cord. 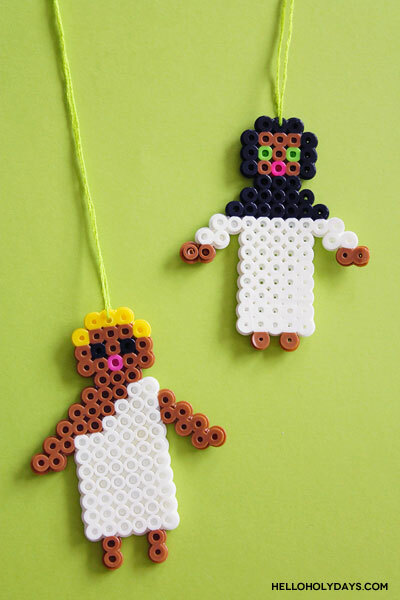 These pilgrim shaped pendants are made with Perler beads for cool looking necklaces! Great for kids ages 6+. 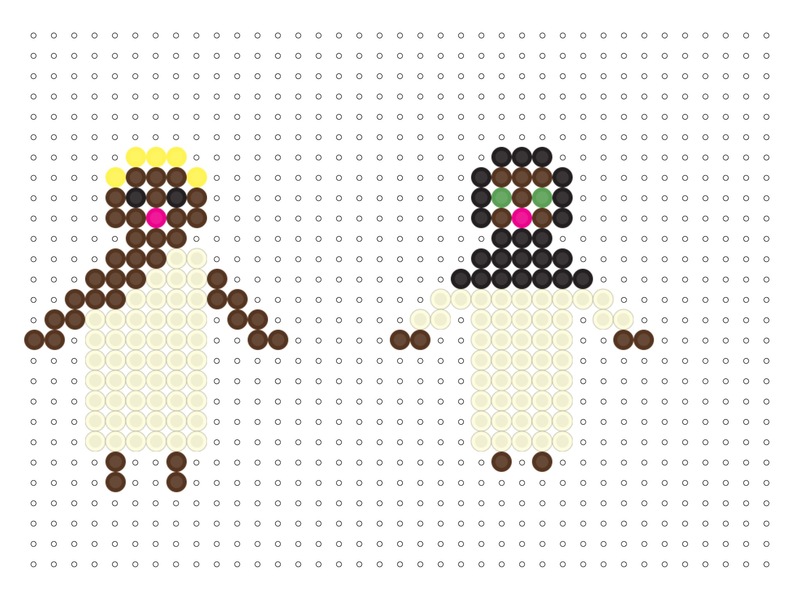 Use my attached pattern to make the pilgrims – or you can make you can make your own pattern too! Once ironed, use a sewing needle to pierce a small hole in one of the top Perler beads. Then, thread the sewing needle with some embroidery floss and take it through the hole you just made. Tie the ends of the thread together to make a necklace.